What. 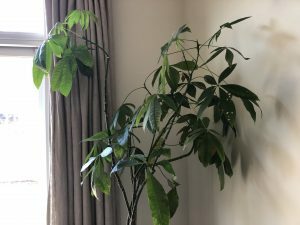 Can I do to save my money tree? Lately it’s been losing leaves. They turn yellow/brown and fall off. Some have yellow spots too. One of the braids on the trunk is yellow and drying out. My tree used to be full and grew leaves vigorously after a cut. What do I do? Thank you for writing, about saving your money — your ‘Money tree’, that is. It’s unfortunate that your tree is failing. After all, the Money tree is associated with good fortune, particularly in East Asia. So with a bit of luck, and effort on your part, hopefully all will not be lost. The growing conditions need be improved to save your plant. You don’t mention either the pot size, or how often you water. If the leaves are turning yellow first, then brown, what is likely happening is that it’s suffering from too much love: the roots are possibly suffocating, due to a lack of oxygen, because they are waterlogged. Plus, your photo shows the plant positioned next to a fairly bright window, possibly delivering too much direct sun on the leaves. Or, there could either be a hot air vent nearby, or a cold winter draft from the window. Any of these conditions can result in yellowing leaves. For the benefit of readers, the braids you refer to is an ornamental way of growing a number of plants in one pot, with their young, flexible main stems plaited. Again, one of the plants seems to have failed. Your plant is a Pachira aquata: the Latin ‘aquata’ refers to aqua, or water. It is native to the tropical wetlands of Central and South america. So why, then, the problem with too much water? It’s all about good quality liquid drainage: water flowing in and around the roots, then, with gravity, via one or more drainage holes, finding its way out, leaving the roots with a healthy combination of moisture, nutrients and oxygen. Unfortunately your photo leaves us to guess about the soil and pot, or even if the pot is far too small, and soil too dry? The best suggestion is likely to plan a re-potting session. Required: a clean pot with drainage hole(s), new planting medium, and a saucer larger than the bottom of the pot, with plenty of room for you to monitor water draining out. Here is a Toronto Master Gardeners post on Growing Houseplants and contained therein is also a Beginners Guide, hopefully helpful as a refresher. Please also read a prior Master Gardener response to a question on the Money Tree . May you have good luck with reviving your Money tree, and may it enjoy many more years of healthy growth!